I had many highlights as a young boy and was heavily influenced by sport when growing up. It was by accident one Saturday morning when accompanying my grandparents to a 2nd hand book store which they visited every Saturday that I came across a magazine called Shoot. The magazine cover instantly caught my eye and from then onwards it was a love story which made me have wild imaginations of also being idolised one day as “Roy”. Thinking about it now makes me laugh but just picture a small boy reading this magazine week in week out and you will understand its influence on my memory and childhood. 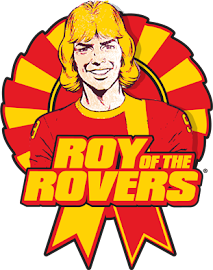 In those days I was hooked on tv series like “A team” and “McGyver” so reading Roy of the Rovers was like a series in itself. On a Saturday morning I would get the previous weeks magazines and wait anxiously for my grandparents to take me to the bookstore. The great thing about the bookstore was that there was no money involved. Once you paid for the initial magazine thereafter it was just a case of exchanging one magazine for the next and in that way my series began. Everything Roy did was idolised by the Melchester fans, they would not want to hear anything bad of their hero and almost had worship like status in his home stadium. If my memory serves me right, he was actually respected by opposition players and coaches but hated by their fans (more out of fear than anything else). The one thing that did disappoint me about the magazine, and to be fair, is that not much was made of, or followed on around his kids as they grew up. It might have been a difficult thing for the writer in those days as we were only interested in Roy. It would have been interesting to see what would have happened to his son and if he ever followed a football career like his father. Roy’s dedication and passion to Melchester Rovers at times took him away from his family life and im not sure if this is quite relevant in today’s professional times. It certainly made me more determined to not miss football practises during the week and always be early for my Saturday games so the influence was there. 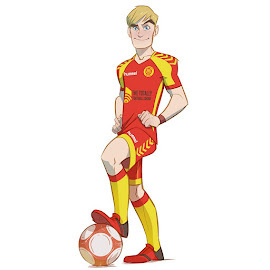 Also in Shoot magazine I became addicted to characters like “Hotshot Hamish” with his bullet like shots , “Mighty Mouse” the fastest and trickiest player ever and “Billy Boots” who could only play football if he had special boots on which was used by a football legend of yesteryear. 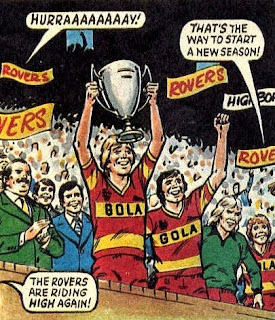 Roy was more unique in that all footballers could relate to him and if you compare the transfer fees mentioned in those days compared to current day then you can imagine how times has evolved. I cannot wait to read the new 12 week edition that is coming out soon, sometimes the child in us will remain there.